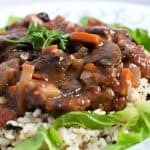 This Savory Mushroom Stew is absolutely perfect for those cold, rainy evenings when you just want something warm and hearty. 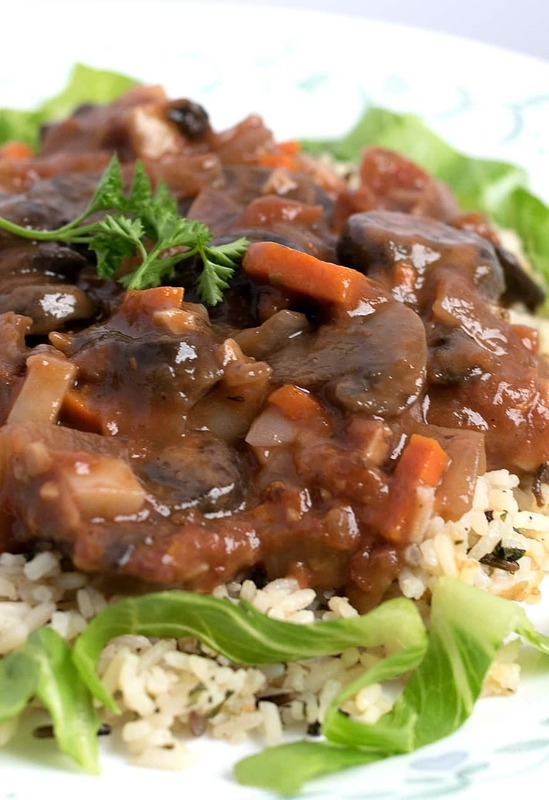 And what’s more comforting than a thick, rich stew poured over some freshly made mashed potatoes or even some fluffy wild rice? All swimming in a rich and savory broth of Veggies and Red Wine. I was fishing around the refrigerator last night looking for something to cook, and spied a few cartons of mushrooms that needed to be used up. It’s quick, it’s hearty, it’s low-fat, and it’s that “stick to your ribs” kind of filling, especially when you pour it over some lovely starches like rice, pasta, or potatoes. We’re going to start by sautéing a chopped carrot and onion in about 1/3 cup of vegetable broth until softened and slightly browned. Just be sure and keep things stirred up a bit so nothing sticks. Add a little salt and pepper here to season and then save them to another bowl. To our now empty pot, add an 8oz package of Brown Mushrooms (Baby Bella) and another 8z package of White Mushrooms (Button, Crimini) and cook over medium heat until softened. The mushrooms will release their own liquid so there should be plenty of moisture for cooking. You can always add a splash of Veg Broth if it looks like anything’s going to stick. Season the mushrooms with ¼ tsp of Thyme, ¼ tsp of Rubbed Sage, and a dash of red cayenne pepper. Stir to combine and stir in 1 Tbs of Tomato Paste and a 15oz can of Diced Tomatoes. Let that simmer for 3-4 minutes and then evenly sprinkle in 1 Tbs of Flour to thicken it up. Stir the onions back in and add ½ cup of Red Wine. Any flavor will do and the alcohol will be completely evaporated off. The Wine adds a richness that’s hard to duplicate with just water or Veg Broth alone. Finally, add in 1½ cups of Vegetable Broth , 1 chopped potato, and 2 cloves of minced garlic. Allow that to simmer until the potatoes are soft and cooked through…..about 15-20 minutes. Season with 1 Tbs of Soy Sauce, ½ tsp Red Wine Vinegar, and a few shakes of salt and pepper. You can serve as is, or ladle over cooked rice, pasta, or mashed potatoes. As always, please leave those comments! I love hearing from you! 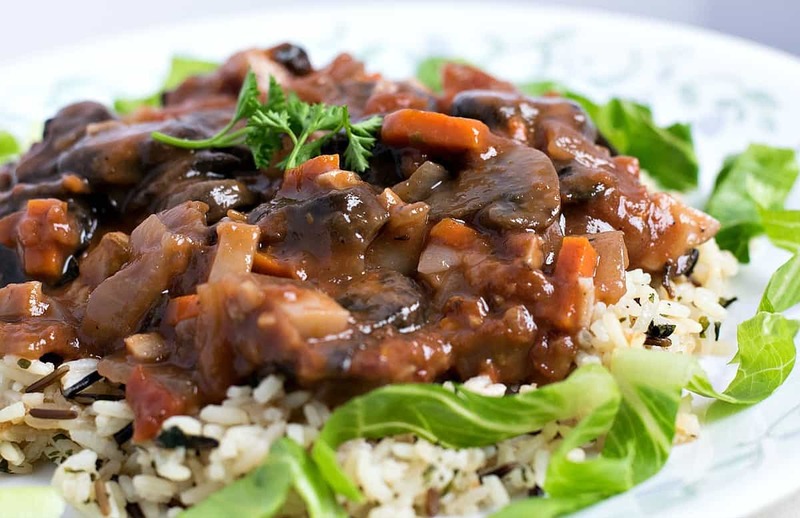 This Savory Mushroom Stew is absolutely perfect for those cold, rainy evenings when you just want something warm and hearty. You know.... comfort foods. Stir the onions back into the pot. Thanks for the recipe. It was easy and tasty and filling. I served it over rice for my husband and over sweet potato noodles for me. I forgot to add in the wine so will include some tonight with the leftovers. I always forget to cook with wine (although I drink it often enough!). But I’m sure it’d taste awesome with the mushrooms here! What could you substitute for the mushrooms? I have someone who doesn’t like the texture and can’t eat them. I recommend shiitake mushrooms which have a very different texture. This worked for someone I know who had the same complaint about mushrooms. Is the thyme ground or whole dried? Thanks. I used whole dried thyme. I didn’t have any canned diced tomatoes, so I used 1 large tomato, diced, placed , and added (a bit less than) a cup of water and nuked it for a minute. I also didn’t have RED wine or RED wine vinegar, so I used white wine versions of both. It probably didn’t turn out exactly like what you made, but I sure liked it over my cooked barley. One thing I have missed terribly since ditching meat is the beef stew I used to make in the slow cooker. As it turns out, what I’ve been missing is the savory vegetables and sauce that go with it! This recipe hits the mark perfectly. As I did when making beef stew, I upped the carrots and potatoes because that is the way we love it. I served it over rice and, honestly, I cannot wait to have the leftovers for lunch today. You don’t specify if you slice the mushrooms or leave them whole. I can’t tell from the picture although I think they’re sliced. I could not tell from the picture either — but if you leave them whole or in chunks the result will be a “meatier” chew, so I think you could do either. Outstanding flavor! The only thing I will do differently next time is to saute the onion and garlic alone at first, and then lightly steam the carrots and potatoes. I’m pretty sure I cut them too large because the cooking time took much longer. Oh,..I did maybe put in an extra splash or two of red wine in as well. Next time, I will serve over wide noodles; over potatoes was good, but I think noodles will be better. Love how the flavors meld Chuck. Thank you!! This recipe is delicious! Big hit with my husband! I didn’t have a potato……..added a can of cannelloni beans. Worked out fine! it looks so delicious thank you for the recipe. i will try it. Chuck, this was wonderful.! By habit I added some celery to the onions and carrots; then a bit of bay leaf to the rest. I served it over wild rice mix. Great appreciation from my SAD (but open minded) husband. Thanks for another wonderful recipe! How many servings does this make?? I’d love to make it for my family but we’re kinda big! You could always double it and freeze the leftovers! We loved this wonderful stew! I made it with tomato purée instead of diced tomatoes because my family doesn’t like diced. It was really great. It would also be good without the potatoes in the stew, especially if you’re serving it over mashed potatoes. Made this for my omni family last night and it was a big hit! Rich, warm, and filling. SOOOOO GOOD!! Yummy, but more tomato-based than I anticipated; I was looking forward to the mushrooms being the star of the dish. I added celery seeds, a bay leaf (what is stew without a bay leaf?) and a dash of smoked paprika, then served over a quinoa-brown rice mix. It was definitely yummy and filling but will definitely need some tweaks for my palate.